What would yachting be without champagne?! Champagne is probably the most famous wine in the world. Although not all Champagnes are great, the best sparkling wines in the world do indeed come from this region. The wine must come from the region of Champagne and is made from three different grape varieties, Chardonnay, Pinot Meunier, and Pinot Noir. Champagne labelled as Blanc de Blancs is made solely from Chardonnay, while Blanc de Noirs is made from black grapes. As Champagne has a marginal climate and the vintages can vary considerably in quality from one year to the next, most Champagne is made from a blend of different vintages and villages to create a consistent house style. Vintage Champagne, however, is made only from grapes harvested during one particular year. Producers here only make vintage Champagne during years where the grapes have had exceptional growing seasons, and the wine is aged longer than non-vintage Champagne before release. Making Champagne is a complex and elaborate process. First, there is a still base wine, appropriately blended to maintain the house style. Then a dose of sugar solution and yeast, known as liqueur de tirage is added, and the bottle is sealed with a crown capsule. Thanks to the yeast and the sugar, a second fermentation will take place which will create some alcohol and, more importantly, the signature bubbles - the CO2 produced during this second fermentation is captured within the wine. The dead yeast cells left over from the second fermentation in the bottle provide a source of aromas and complexity for the wine. The longer the wine is left on the yeast bed, the more complex it will be. For non-vintage Champagne, the minimum is 15 months, and for vintage Champagne, the minimum is 36 months. The wine is then separated from this sediment and closed with a champagne cork before being sold. Bordeaux is arguably the centre of the fine wine world. No other region has influenced the rest of the world regarding winemaking and style to the extent that Bordeaux has, and the grape varieties here are some of the most popular on the planet - Cabernet Sauvignon and Merlot above all, but also Cabernet Franc, Petit Verdot and Malbec. Although Bordeaux is most famous for its red wines, the white wines made from Semillon and Sauvignon Blanc can also offer excellent quality, especially from the Graves and Pessac-Léognan regions, located south of the city. Also, Bordeaux produces some of the finest sweet wines in the world, particularly those of Sauternes. For red wines, different communes in Bordeaux offer slightly different styles. In the first instance, the overall region can be divided into the vineyards on the Left and Right Banks of the Gironde river. On the Right Bank, Pomerol and Saint-Émilion are the two main communes, whose wines are both predominantly based on the Merlot variety. On the Left Bank, Margaux, Saint Julien, Pauillac and Saint-Estèphe are the names to remember, all specialising in Cabernet Sauvignon. Saint-Estèphe and Pauillac tend to have firmer tannins and structure than the slightly softer Saint Julien and the more fragrant and elegant Margaux. The best wines from Bordeaux are classified as Grand Cru Classé. This is a famous classification system that was introduced in 1855 whereby the estates were classified according to the average price of their wine. Despite the fact that the classification is more than 160 years old is still of great importance. Click for a more detailed description. For the 1855 World Exhibition in Paris, the Emperor Napoleon III requested a classification system be created for the best Bordeaux wines, which were to be on display for visitors from around the world. Brokers from the wine industry ranked the wines according to the château’s reputation and trading price, which at that time was directly related to price. At that time, the wines which fetched the highest price got the highest classification, of course this had everything to do with quality as well. The result was the Bordeaux Wine Official Classification of 1855. The wines were ranked in importance from first to fifth growths (crus). All of the red wines that made it on the list came from the Médoc region, except for one: Château Haut-Brion from Graves. The white wines, then of much less importance than red wine, were limited to the sweet varieties of Sauternes and Barsac and were ranked only from first great growth to second growth. Since 1855 there has only been one change to the classification and that is Chateau Mouton Rothschild, whom was promoted to 1st growth in 1971. It might be interesting to note that the owner of this Chateau was a very wealthy and influential man in the region. Regardless of politics and the age of the classification the first and second growths are indeed some of the best wines in the world. Click here for full Bordeaux classification list. Burgundy is one of the most complex wine regions in the world and when looking closer at how it’s structured it is easy to understand why. 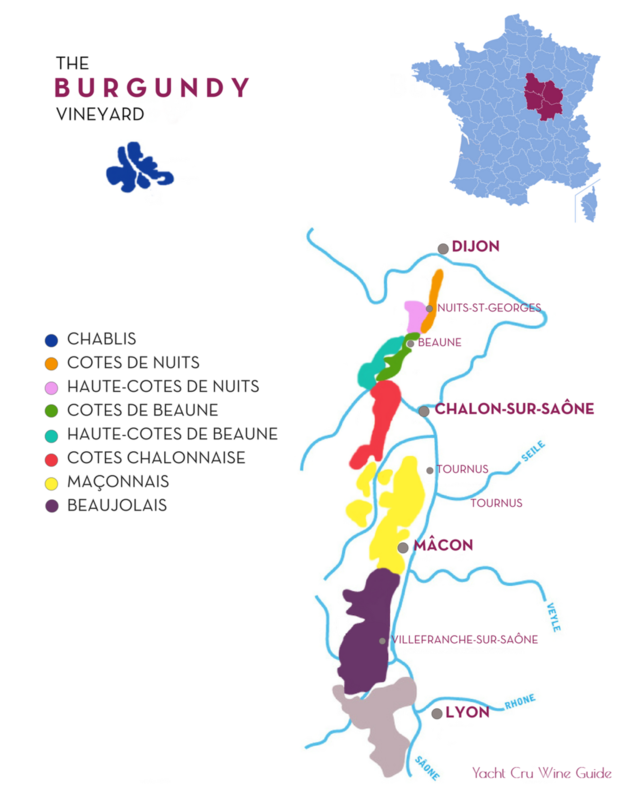 The region is divided into five main sub-regions, namely Chablis, Côte de Nuits and Côte de Beaune (collectively known as the Côte d’Or), Côte Chalonnaise and Mâconnais. So far it’s not too bad but then we have to add around 600 premier cru vineyards and 30 grand cru vineyards to get the full picture and even more producers. This complex mosaic creates what many feels to be the greatest wine region in the world, both for red and white wines. White Burgundy is made from the famous variety Chardonnay, while reds are made from Pinot Noir. Chardonnay actually originated in Burgundy, where there is a village called Chardonnay, near Mâcon. The heartland of white Burgundy is the Côte de Beaune (southern part of Côte d´Or- ´the golden hill site´) with its three great villages, Meursault, Puligny-Montrachet and Chassagne-Montrachet. Here, the vineyard classification system comes into its own. On the flattest land, the wines are classed only as generic Bourgogne Blanc. As the slope begins to rise, the wines are classified by village-level appellation and even higher up the slopes the 1er cru and Grand Cru vineyards. The white wines of the Côte de Beaune are quite different from those of Chablis. In Chablis, the Kimmeridgian clay soil is full of mineral fossils, giving the wine a crisp acidity and the winemakers here use much less oak than in Côte d’Or. Chablis tends to be less creamy and textured, and instead has a leaner style with aromas of citrus, green apples and minerals. The greatest red wines of Burgundy are also found in the Côte d’Or but mostly from the northern part, Côte de Nuits. Here the most famous villages are Gevrey-Chambertin, Morey St Denis, Chambolle-Musigny, Vougeot, Vosne-Romanée and Nuits-St-Georges. In the Côte de Beaune, look out for Volnay and Pommard, two sub-regions making beautiful yet very different wines. Volnay is perfumed and elegant with soft strawberry fruit and silky tannins, while Pommard is considered to be the Pomerol of Burgundy, more structured and sturdy. Click here to read more about Burgundy. The classification system of Burgundy is very different to the one in Bordeaux. Here, the classification is tied to the land itself, and not the producer or château. Many would argue that that the famous concept of terroir has its birth place here in Burgundy. The word 'Terroir' in French can be translated to ´somewhereness´, that each plot of land has its own distinct qualities that one can taste in the wine. 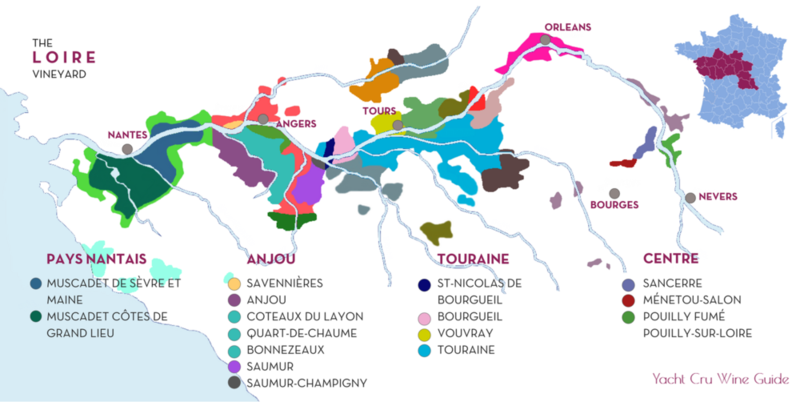 This concept of identifying the different terroirs of the region was developed by winegrowers (mostly monks at the time) over several centuries. Generations of research were necessary to uncover the best sites of Burgundy which ultimately received official recognition, resulting in regional, village, premier cru and grand cru classification. From Regional to Grand Cru with 600 Appellations! The level of complication becomes clear when realizing there are around 600 AC´s in Burgundy. Around 550 premiere cru, some 30 Grand Cru and the rest is village and regional appellations. 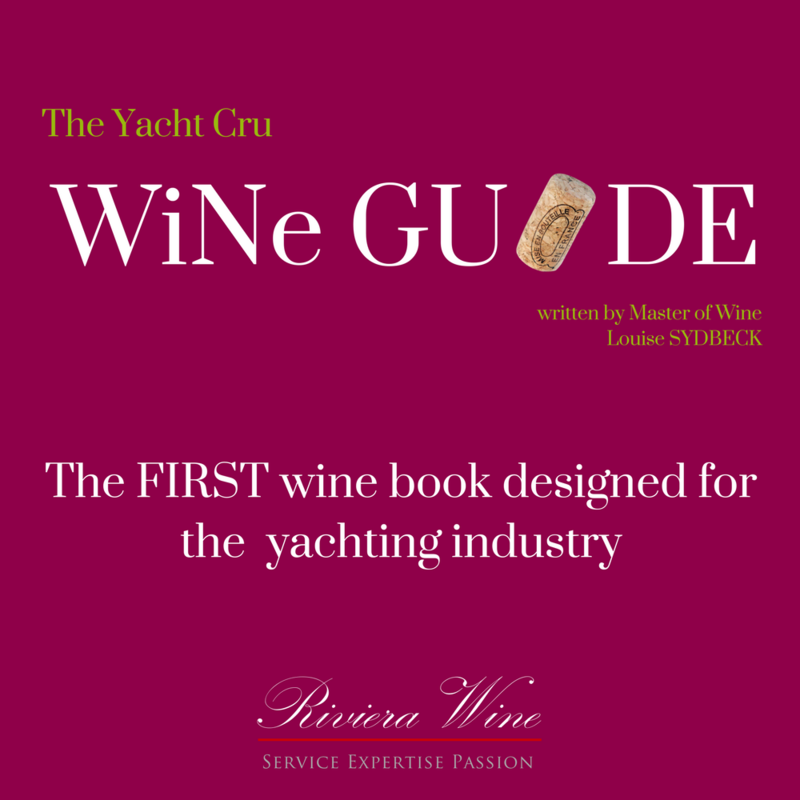 Grand Cru is the highest classification with the most expensive wines and although we hear a lot about them in the yachting industry they only represent 2% of the production. Premiere Cru vineyards stand for around 15% and the remaining land is made up by commune levels and regional wines. Even though the Rhône Valley produces some of the world’s best wine, the region tends to be overlooked in yachting. This lovely and beautiful area offers a vast selection of top quality wines in different styles. The Rhône river begins in Switzerland, and as it makes its way down through the length of France, it widens to become the central feature of the Rhône Valley, which spans roughly between Lyon and Avignon. The Northern Rhône is a land of steep slopes carved into granite hillsides and planted with the grape variety Syrah, known as “Shiraz” in Australia. The wines are dark, firm and tight with black fruit and spicy notes. They are long-lived, and the top villages are Côte-Rotie and Hermitage. There is also some great white wine produced in the northern Rhône. In the regions of Condrieu and Château-Grillet, the grape variety Viognier provides the wine with lovely floral, peachy fruit and a creamy texture. In Hermitage, one can also find some stunning white wines with long ageing potential made from Marsanne and Roussanne. Towards the south, the steep slopes give way to a broad valley floor which is baking hot in the summer. Here, the growers tend to blend different grapes, including Syrah, Grenache, Mourvèdre, Cinsault, Carignan and more. The wines are less firm and have softer, red fruit and broader structure. Châteauneuf-du-Pape tends to produce the best wines in the south, though Gigondas and Vacqueyras are also capable of excellent quality. The Loire Valley is a very exciting region where white, red, dry, sweet and sparkling wines are all produced. Some of the wines from the Loire are world famous and others somewhat obscure, and among the latter group are some of the best-kept secrets in the world of wine. Sancerre and Pouilly-Fumé are familiar names to most wine lovers and these wines are very popular in yachting. The whites are crisp, fresh and have aromas of gooseberries, lime and minerals. They are made from the Sauvignon Blanc grape variety, and, as with most Sauvignon Blancs, are not made for ageing. Though Pouilly-Fumé can produce only white wine, Sancerre also produces red and rosé wines from Pinot Noir. Further west in Touraine, the Vouvray appellation produces white wines from Chenin Blanc. One can find fantastic wines with great ageing potential and offering great value. What could be nicer on a hot summer’s day on a yacht than a glass of rosé? With more than 300 daysof sunshine per year and mild winters, Provence benefits from a beautiful Mediterranean climate. Around 80% of the wine produced in Provence is rosé, mostly from the grape varieties Syrah, Carignan, Cinsault and Grenache. There are also great red and white wines made here, and the dry climate is ideal for organic winegrowing. The red wines permit up to 30% of Cabernet Sauvignon in the blend, lending the wines greater structure and power. White Provence wines are made from Rolle and Ugni Blanc, are usually unoaked and are quite refreshing. 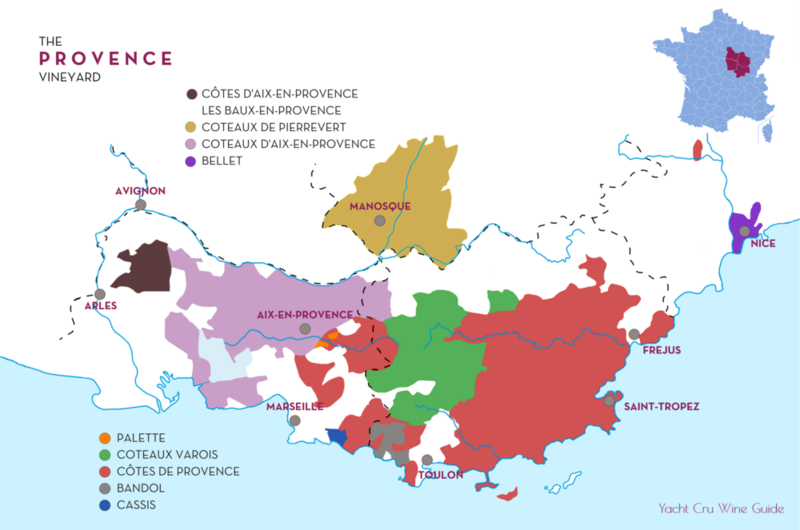 Côtes de Provence AOC is by far the largest appellation in Provence, stretching from Toulon to the Massif des Maures, near Fréjus and Saint Raphael. Bandol is another appellation and is perhaps the most significant for quality red wine production. The main grape variety here is Mourvèdre. These are dark, full-bodied wines with plenty of tannins and meaty flavours of brambly fruit and oak spice. Despite its location in the far north of France, Alsace has a very favourable and dry climate because of the protection of the Vosges mountains. It has almost as many sun hours as Saint Tropez, allowing for an extended ripening period, enabling the grapes to reach their full aromatic potential. The wines are mostly white, fragrant and usually varietally labelled. The so-called noble varieties are Riesling, Pinot Gris, Gewürztraminer and Muscat. It can sometimes be difficult to know the sweetness level of Alsatian wines. Many of them are slightly off-dry with a purity of fruit that makes them a perfect match for local food. Wines labelled as Vendange Tardive, meaning “late harvest”, will be medium-sweet. You will also find wines labelled as SGN or Sélection de Grains Nobles. These are made from grapes affected by noble rot – like in Sauternes – and are fully sweet with refreshing acidity. Both Vendange Tardive and SGN wines are excellent matches with foie gras.